So I was watching Downton Abbey Sunday night and heard Lady Grantham mention the town of Thirsk. I wanted to hear the rest of the dialog, so didn’t exclaim to Dean, “Thirsk! That’s where the All Creatures Great and Small author lived.” After the episode ended, I didn’t think it important enough to tell Dean — and he would not have cared anyway. I guess I knew that Downton Abbey was located (but not filmed) in Yorkshire — and mention of York later in the episode made me even more certain, but I wondered where exactly it was supposed to be. I read on Downton Abbey Wiki that in some episodes a sign in the fictional town of Downton points to Ripon (9 miles one way) and Thirsk (6 miles another way). 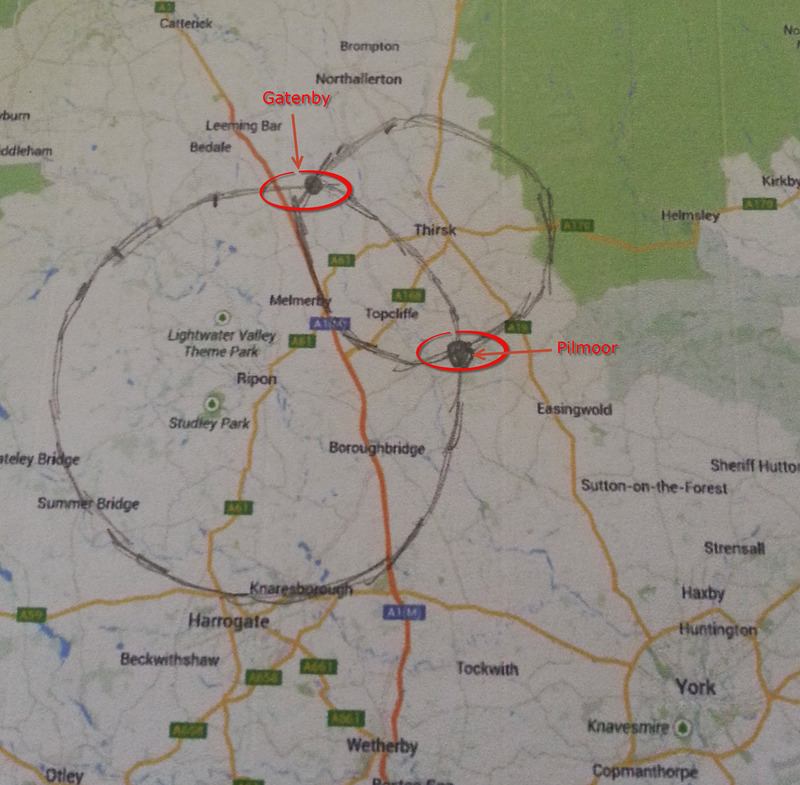 So I located Ripon and Thirsk on a Google map, printed it out and drew a 12 mile wide circle around Thirsk, with Thirsk being the center and did the same with Ripon, only making that circle 18 miles. The circles crossed in two locations, so I’m thinking that the fictional town of Downton is either located in the tiny hamlet of Gatenby or Pilmoor, North Yorkshire. Because Easingwold, according to the wiki I mentioned earlier, is also mentioned in Downton Abbey, I think Pilmoor is more likely the location. This is not the first time I have scoured a map to find a location from a fictional source. In fact the first time I did it was after reading the All Creatures Great and Small series. Because I’d spent some wonderful weeks in Yorkshire and the All Creatures Great and Small series took place in Yorkshire, I wondered if I may have been in the town where it took place or even crossed paths with the author. I asked Jack Burgoyne, my boyfriend’s father and a librarian, if he knew where the books took place but he didn’t know — however he did know that James Herriot was a pseudonym and Darrowby, England was not a real place. When I returned to the United States after visiting Jeremy and his family, I pulled out a map of England and noted the real places mentioned in the books (which, when I search the book now, not many other than Leeds and York are mentioned) and tried to figure out where “Darrowby” was. I was never successful, but the search was fun. The last time I visited the Burgyones as Jeremy’s girlfriend, Jack alerted me to an article in the newspaper about James Harriot, aka James Alfred Wight. 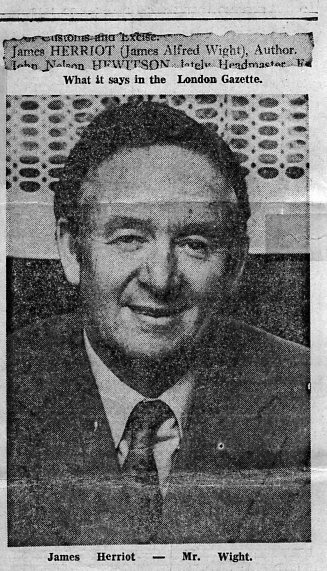 It seemed that he’d been awarded the OBE and the London Gazette gave away his real name and the Evening Post (Leeds?) gave more away stating — the town was Thirsk, in North Yorkshire. I now knew that I’d never been to the town where the books took place nor was it likely I’d crossed paths with the author. So while I don’t always hit the nail on the head when sleuthing for real locations of fictional places, I come pretty close. The internet is a big help these days, since people often do the work for me, but I get a strange pleasure out of doing it myself. I so like learning about people’s eccentric (in a good way :)) pastimes.